Ruth First and Joe Slovo, husband and wife, were leaders of the war to end apartheid in South Africa. Communists, scholars, parents, and uncompromising militants, they were the perfect enemies for the white police state. Together they were swept up in the growing resistance to apartheid, and together they experienced repression and exile. Their contributions to the liberation struggle, as individuals and as a couple, are undeniable. Ruth agitated tirelessly for the overthrow of apartheid, first in South Africa and then from abroad, and Joe directed much of the armed struggle carried out by the famous Umkhonto we Sizwe. Only one of them, however, would survive to see the fall of the old regime and the founding of a new, democratic South Africa. 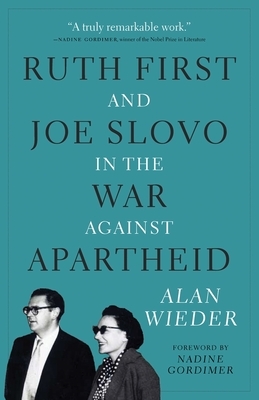 This book, the first extended biography of Ruth First and Joe Slovo, is a remarkable account of one couple and the revolutionary moment in which they lived. Alan Wieder's deeply researched work draws on the usual primary and secondary sources but also an extensive oral history that he has collected over many years. By weaving the documentary record together with personal interviews, Wieder portrays the complexities and contradictions of this extraordinary couple and their efforts to navigate a time of great tension, upheaval, and revolutionary hope.